Do you have a Berkey countertop water filter? If you do, you might be interested in the following 5 Berkey accessories to compliment your countertop drinking water filter. If you don’t have a Berkey countertop water filter, I will say that it’s one of the best there is! We use our Big Berkey for all of our drinking water at home and when we’re out with our 5th-wheel trailer. One of my strongest suggestions for general preparedness is to buy a quality countertop water filter. Further, a good portable water filter (I like the Sawyer Mini). After using my Big Berkey for awhile, I always found it annoying that in order to find out how much water was left in the bottom reservoir, you had to lift up the top reservoir to look inside. Rather than continuing to deal with this, the first and most noteworthy accessory that I bought was the glass water level spigot! It’s a no-brainer. If you have a Berkey with the black filter elements (all the new filters come with these), it’s best to have a priming bulb for it’s initial use or if you ever replace the filter elements. 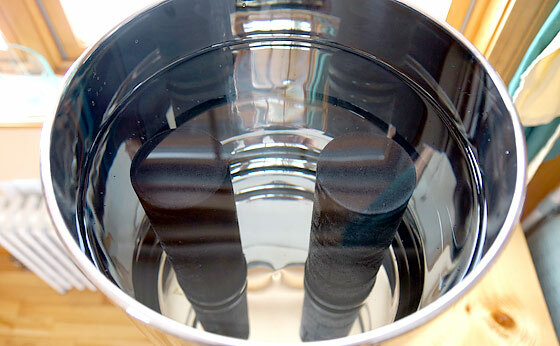 Priming the Black Berkey Elements saturates the filters with water prior to their use. It also purges (or back-flushes) using air instead of water to clean the pores of the filter wall for storage. 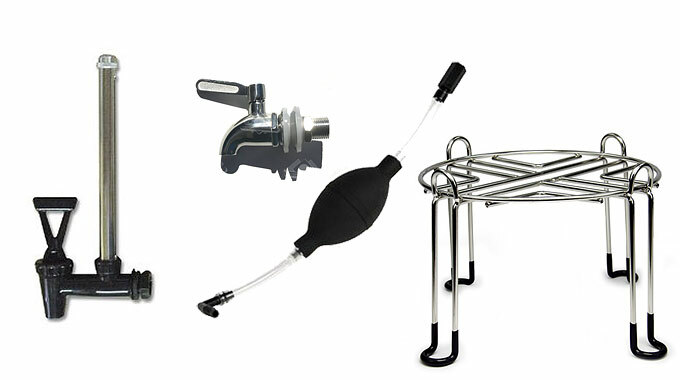 A general purpose maintenance kit with washers, nuts, and more. One is none and two is one. Having an extra spigot whether it’s an extra glass water level spigot or this one, is a smart thing. If it breaks, your SOL without it. While I simply set my Big Berkey on the edge of a countertop, their stainless steel wire stand enables you to place the filter anywhere you want – providing room underneath the spigot to fill your cup or container. Each filter element is rated for 3,000 gallons of water treatment. 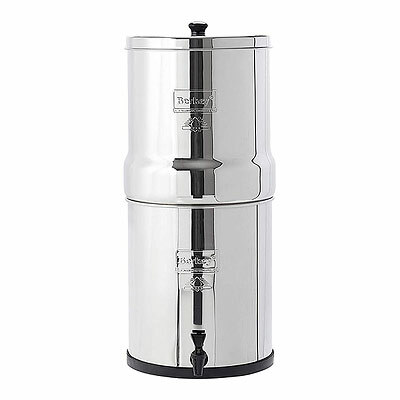 Tip: I really like the Travel Berkey 1.5 gallon filter system. Compact size, yet yields 2.75 gallons per hour. 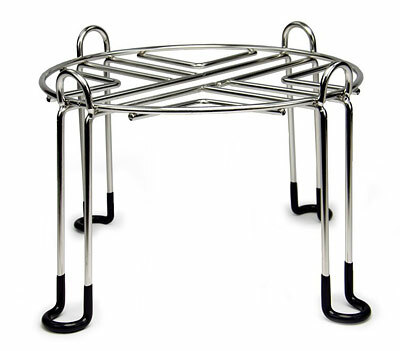 Nice for RV or space saving on the counter. Have a Travel Berkey with the extra metal spigot, purchased a few months back. I swapped out the installed plastic spigot with the metal version and found out the fit was loose. I need to add a plastic washer “spacer” since I ran out of threads to tighten up the spigot. The metal spigot appeared to be a third party add-on in the shipment. I didn’t call back on the order, just pick up a few spacers at the local hardware store. Did prime the unit and test it out a couple of times, very nice. Dried out the elements and repackaged for long term storage. In hindsight, probably should have purchased a larger unit, but one is better than none. Drinking water a top priority, the Texas disaster brought it to crystal clear focus. Cases of water stored, 6 Auqatainers, many 1 and 2 gallon jugs, 2 Lifestraws, 2 Sawyer Minis, generator for the deep well. Looking at a 55 gallon water storage barrel, a micron level “Katadyn like” water filter. Even if I never need to use this gear, peace of mind and can “bequeath” to the next generation. As I wrote this, I kept thinking about the Houston flooding situation with so much water around — but not safe to drink without filtering / purifying. 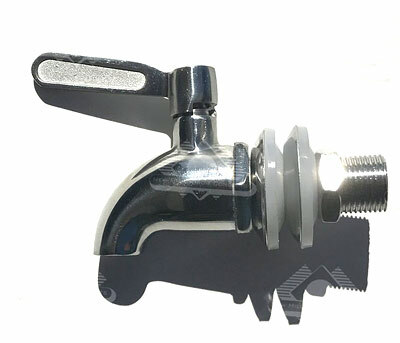 Ken, I should have check for the Berkey made metal spigot, I usually check any optional parts are from an original equipment manufacturer (OEM), third party parts are typically less expensive but, to me, not as “to specification” like an OEM does it. I worked with many big, medium and small OEMs; when your business depends on your proprietary product being of consistent, repeatable quality “most” OEMs have their act together, some not so much. We have a brita water filter. I know it’s not as good as the Berkley but we use it on standard city water now and it makes it taste much better. If we have a shtf situation I think the brita filter and boiling should make any water potable. Can anyone confirm this? Boiling will always work – with the exception of chemical contamination. I keep bleach and I have rain catch barrels if the need arises so its not likely I will be using ditch water. The filter should remove large contaminants. Boiling will take care of most of the rest. If you’re taking water from a possibly contaminated source (such as flood waters) it may be necessary to take other steps, such as chlorine. Taking from a cleaner source (rooftop, well, etc) filter and boil should be sufficient. Car guy, I use a Brita as well. It reduces chlorine, mercury, and cadmium. It makes municipal water taste better. It does not remove pathogens or particulates. In order to remove those, you need to filter with something like a Sawyer or Katadyn. Boiling will kill pathogens but won’t remove particulates or chemical contamination. I believe that the only way to remove chemical contamination would be distillation. Just Water filter removes even fracking chemicals. can get them thru the NRA site. Info from the CEO after questioning for a friend. I bought a 4 legged oak bar stool at a flea market for $5 to set my Big Berkey on. It’s the perfect height for accessibility. I normally have to refill it everyday, as we drink exclusively from it. I keep a half gallon tea pitcher by the kitchen sink to refill it with. Over time I have learned by how much effort it takes to “tilt” the Berkey, just how much tap water I need to add without overfilling. I consider this filter to be an indispensable part of my preps. It greatly increases the possible sources of potable (safe) drinking water when it stops coming out of the faucet. Water isn’t a problem in our area, many irrigation ditches and the river, but clean water is a concern always. If we have time and water we will fill the 90 gallon water tank in our motor home. If not I have ordered 10-2 gallon water containers we will fill now and store along with a case of bottles water, and about 25 liters of water. But because we have no idea what sort of situation may arise we also have an Alexapure 2.5 gallon large filter system, an Alexapure pitcher, several Life Straws (two in each car) and extras in the house and a Seychella pitcher. All with extra stored filters, just in case. I also have a distiller put away in deep storage because I live relative close to salt water and if necessary could distill the salt right out of the salt water. That should cover about everything I hope, guess we never know untill we face the situation first hand, so all we can do is Pray. Not really. Just place a pitcher underneath for the water to run into. Less convenient, but it works. We do not have a berkey, but we do have a family lifestraw and some singles also. Also water that is stored in any empty container we can. Thinking about one but have not settled yet. I guess there are pros and cons to all of them. Not bad for an old fart huh? I do LOVE my Berkey Even more than Gin, now that’s saying something. PS; for the money, ya cant get a better filter system, but stay away from the ceramic filters, stay with the Charcoal ones. Thanks I had them on the list of favorites, but will delete them and save $$$$$. I am on a well but using a Water Softening System. Berky website says I need to bypass the water Softener. I also Have Heavy Iron and I have an Iron filter too. Are there any practical ways to accomplish this? The Plumbing lines runs into the house immediately from the iron filter and water softener. I do have a hand pump on the top of my well which produces ok water which I have directly consumed (before my water treatment system) without getting sick… Yet…. Let me know what you guys think of this issue. First of all do you have a certified dowser in your area with years of expertise in dowsing? Am not referring to some who can pick L rods and say they are a dowser. Am speaking about someone who was trained by a master in this field and attended classes. If you do not, you can contact the Dowsing society for one to assist you. It will cost you, each area the prices are different. It should be a one time charge for the service, like having the repair man out to fix your appliances. Not into that,,,,, that is ok.
Another option, having the water pumped into a holding tank, the iron particulates will fall to the bottom of the tank. We have our delivered through the top port hole and feeds out the bottom into the pressure tank to the house. It is also nice having my training to fix such problems (at our home) that due occur when wells not drilled on a live stream. The Ground is unique I’m in South FL – subtropics All my neighbors are in the same boat with their wells. It seems the Iron is infused in the water. It won’t kill you but the Berky filter will get clogged quickly from the well. I guess the salts in the water softener also clogs up the berky and ruins the filter. I may just have to reserve using the berky for purifying surface water instead during a survival situation. I can always hand pump my well water and drink it. Not the best though. Thanks for your help. filter your air conditioner water. Gave this some thought about your water situation. You could set up a system like we have. Two food grade buckets, one water filter(Amazon), one water spigot(amazon). 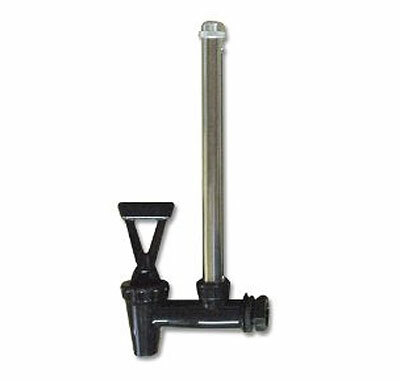 Checked on line found the Daulton 10″ pk of 4 for 89.70, and plastic spigot $4.04. This way you could filter your water and store it way from what you get out of the faucet. Then when you were ready you could purchase the Berkey for future use. The video how to put these together is on BC trucks site. Simple way to have water purification system until you can put a Berkey on to the counter at your home. It also helps those who can never afford a Berkey to have a purification system for there household. Nice to give those who need pure water when the Pffft hits the fan, a gift for the unprepared. Love my Berkey. If budget allows get the see through spigot. I also have the stainless stand. When I first bought the Berkey the only stand was a Berkey Light stand. Not so great. Had to really balance it correctly! 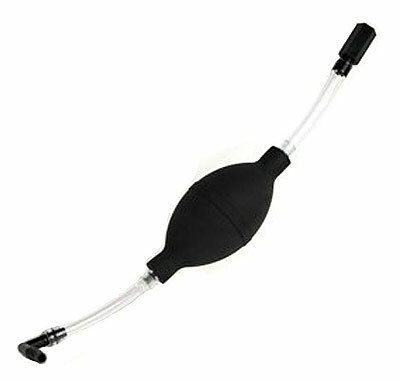 I want to get spigots for my 3.5 gal buckets. Any ideas out there in Prepper land? Do you think the stainless spigot will fit on a plastic bucket? NRP, why stay away form the ceramic filters? Also Lehman’s sells a distiller. Not cheap. You handy folks could probably make one. This is one thing we need to invest in. We have little filters, Sawyer and Lifestraw. We just haven’t had the money to get the Berkey yet. Saving up for that one. It seems that things keep coming up. Life. Everything breaks down or costs more money and not more money coming in. NRA has a filter system made by “Just Water” cheaper for an interm unit. abt 60-80$ for buckets spigot,filter. I have one of theirs an we use it, it does remove iron but not recommended for salt water. Seems to me that mine came with something. Maybe some washer type things to make it easier??? aka: Yes, but those static primers rely on water pressure–you must have running water for them to work. The primer they’re talking about here has a bulb to force water through. I hated spending the money on a Big Berkley unit, but I’ve decided to use it daily to spread the cost per serving around. It looks nice on my counter top & I’ve been able to use it to spur productive conversations with friends about personal responsibility to be prepared for at least a couple weeks of no power, or a job loss. We use our Berkey every day for ALL of our drinking water, coffee, and ice making. It does help to justify the cost – plus assuredness of excellent drinking water.